FORT LAUDERDALE, Fla. -- President Donald Trump's upscale Mar-a-Lago club received permission from the federal government to temporarily hire 70 foreign housekeepers, waiters and cooks to fill out its staff during its upcoming busy season, with its managers attesting there aren't enough Americans qualified, willing and available to do the work. The president's hiring of foreign workers at the Florida resort over several years was criticized by his opponents during the 2016 campaign after he slammed companies for moving jobs out of the U.S. and others for hiring immigrants in the country illegally. During the Republican primary debates, Trump defended Mar-a-Lago's hiring practices, saying not enough Americans apply for its low-end service jobs and if his managers didn't recruit outside the country "we might as well just close the doors." Trump Organization spokeswoman Amanda Miller did not return calls and emails this week seeking comment. Janine Gill, Mar-a-Lago's personnel director, also did not return a call. Trump visited Mar-a-Lago seven times after his Jan. 20 inauguration and is expected back this season, perhaps as early as Thanksgiving. Under requests approved by the U.S. Labor Department, Mar-a-Lago can employ 35 foreign waiters, 20 cooks and 15 housekeepers to help serve its 500 members starting this month through May 31. The waiters will receive $11.88 an hour with no tips, the cooks $13.34 an hour and the housekeepers $10.33 an hour. The waiters' and cooks' wages are slightly above the national average for those fields and the housekeepers' slightly below, according to Labor Department statistics. And Mar-a-Lago is not alone. Many other high-end resorts and clubs in Palm Beach County annually receive similar approvals from the government, including 141 foreign employees this year for The Breakers, a historic beachfront hotel near Mar-a-Lago, and 65 for The Polo Club of Boca Raton. All are offering wages roughly similar to Mar-a-Lago, according to their Labor Department filings. The area's peak tourist season is from about Thanksgiving to Easter. Peter Ricci, director of Florida Atlantic University's hospitality and tourism program, said most foreign workers hired by Palm Beach County resorts are students from Ireland, South Africa, Portugal and the Netherlands who are fulfilling a graduation requirement. Ricci, who has studied and worked with the local resort industry, said most American hospitality students don't want to work as servers but want to get into a management trainee program, while the foreign students see high-end waiter and service jobs as possible careers and are eager to take them. "The more upscale the type of venue, the more difficult it is to hire the type of (American) server or employee that we need," Ricci said. "With their culture from their home countries, (the foreign recruits) come with a more dedicated attitude for service that the recruiters just can't find enough of locally." Palm Beach County's unemployment rate is 3.6 percent, below the national rate of 4.1 percent. The county's Great Recession rate peaked at 11.6 percent in August 2010 and has been in a steady decline since. 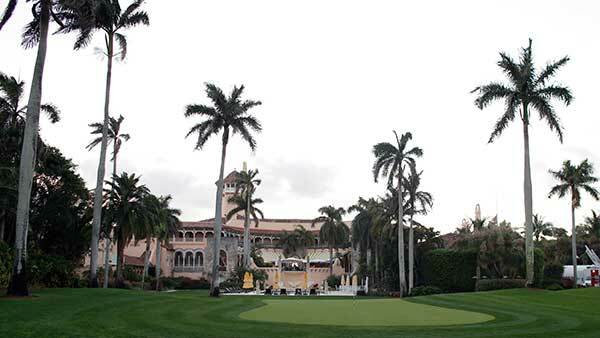 Mar-a-Lago's members pay $14,000 annual dues for access to the 17-acre estate, with new members paying a $200,000 initiation fee that doubled earlier this year. Trump purchased Mar-a-Lago - "The Greatest Mansion Ever Built," according to its website - from the foundation of cereal heiress Marjorie Merriweather Post in 1985 for $10 million and has invested tens of millions of dollars improving the property. He opened it as a club in 1995. The property now boasts 58 bedrooms, 33 bathrooms, a 20,000-square-foot ballroom, tennis and croquet courts and three bomb shelters. Members pay extra to dine and stay on the property.